[153 Pages Report] A display driver IC controls the current and voltage requirements across the display panel for it to function. The display driver receives image data from timing controller and delivers precise analog voltages or currents to create images on the display. 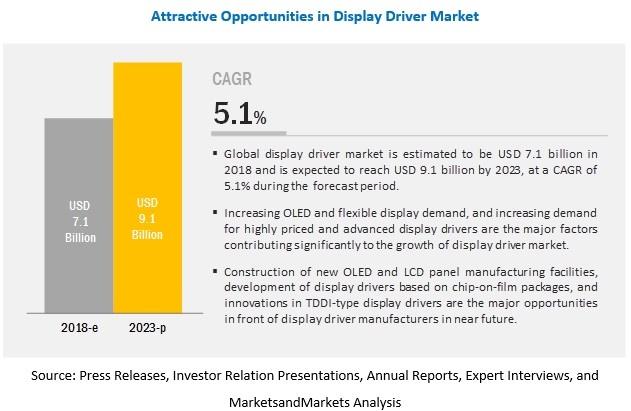 The display driver market is estimated to grow from USD 7.1 billion in 2018 to USD 9.1 billion by 2023, at a CAGR of 5.1% between 2018 and 2023. The market is growing due to the increasing demand for OLED and flexible displays, adoption of highly priced and advanced display drivers, and growth in the automotive display market. Growth in the use of 4K and 8K televisions and availability of UHD content, and evolving role of DDICs in individual components and single integration chips also drive the growth of the market for display driver ICs. The OLED display panel market is expected to grow rapidly during the forecast period which will eventually increase the demand for high-performance display driver ICs and subsequently drive the market toward higher growth. OLED and flexible displays are trending in the display market due to their increasing adoption in smart devices such as smartphones, wearables (smartwatch, AR/VR HMDs), and smart TV. South Korea accounts for more than 95% of total OLED display panel production, owing to which majority of OLED-based display driver demand is emerging from South Korea. With huge investments from Samsung and LG Display in OLED technology and their production expansion, South Korea is expected to dominate the display driver market for OLED displays, in terms of size, during the forecast period. Small devices account for the highest demand of display drivers. Display panels are used in several small devices such as smartphones, automotive displays, tablets, feature phones, industrial displays, small medical devices, camera, and others. Automotive displays are expected to witness positive growth in terms of shipments during the forecast period. Smartphone is one of the leading devices accounting for a majority of the global display driver market. The display driver market in small devices is expected to be driven by the smartphone segment during the forecast period. Smartphone display panels are produced in the range of 1.5–1.7 billion units yearly. With innovation in display technology (LTPS-LCD and OLED), the rapid adoption of flexible display panels, and the introduction of full-view displays in smartphones, demand for TDDI and COF-based display drivers is expected to increase rapidly in the next 2 years. A majority of display driver demand comes for LCD and OLED displays. These displays are produced in Asia Pacific, especially in countries such as China, South Korea, Japan, and Taiwan. Construction of Gen 6 and above facilities by Chinese players, with government support in terms of finance and land offerings, can have a significant impact on the global display panel market. This will increase the production of LCD and OLED displays in China and subsequently increase the demand for display drivers for a majority of the applications. The increasing adoption of OLED displays by Chinese smartphones vendors, and TV and smart wearable device manufacturers is boosting the demand for OLED display panels in the country also the favorable and cost-effective manufacturing environment in the country is facilitating the increase in the display panel production in China. Samsung Electronics Co., Ltd. (Samsung) (South Korea), Novatek Microelectronics Corp. (Novatek) (Taiwan), Synaptics Incorporated (Synaptics) (US), Himax Technologies, Inc. (Himax) (Taiwan), Silicon Works Co., Ltd. (Silicon Works) (South Korea), Raydium Semiconductor Corporation (Raydium) (Taiwan), Sitronix Technology Corporation (Sitronix) (Taiwan), FocalTech Systems Co., Ltd. (FocalTech) (Taiwan), MagnaChip Semiconductor Corporation (South Korea), MediaTek Inc. (MediaTek) (Taiwan), Fitipower Integrated Technology Inc. (Fitipower) (Taiwan), and ROHM Co., LTD. (ROHM Semiconductor) (Japan) are the leading players in display driver market. Other important players in the market are Yunnan OLiGHTEK Opto-Electronic Technology Co., Ltd. (OLiGHTEK) (China), Solomon Systech (International) Limited (Solomon Systech) (Hong Kong), Microchip Technology Inc. (Microchip) (US), SolasOLED LTD. (Solas) (Ireland), Dialog Semiconductor PLC (Dialog Semiconductor) (UK), Lucid Display Technology (LDT) Inc. (South Korea), SINOWEALTH Electronics Ltd. (China), and UltraChip INC. (UltraChip) (Taiwan). Novatek with second largest market share of more than 15%, has earned recognition in the fabless semiconductor industry as a specialist chip designer for display driver and SoC solutions. Its ICs are primarily intended for flat-panel display and audio–visual applications in other digital devices. Interactive display devices are generating high demand from signage and advertising applications, which is likely to boost the company’s revenue. The increasing trend in the development of sharper and thinner OLED panels is providing high growth opportunities for the company. The company focuses on its export business where it registered a shipment of ~1.0 million pieces of display driver ICs out of a total production volume of ~1.8 million DDICs in 2017. As of 2017, the company generated approximately USD 1.04 billion from its display driver segment. The company is trying to maintain high market share by actively expanding product lines and leveraging technological, service, and cost advantages, establish overseas locations and market channels. In August 2018, Synaptics announced the sampling of its new ClearView R63455 display driver IC (DDIC), which features dual-display 2K resolution combined with foveal transport support for next-generation virtual reality head-mounted displays (HMDs). In May 2018, MagnaChip Semiconductor announced that it launched a new third-generation 40-nanometer (nm) OLED display driver integrated circuit (DDIC) for the next wave of OLED smartphone displays. In October 2017, Synaptics announced a significant expansion of its touch controller and display driver integration (TDDI) product portfolio with 4 new solutions such as TD4362, TD4328, TD4115, and TD4105. What are the opportunities in the display driver market in the next 5 years? How much growth is expected from LCD and OLED displays, and what would be the impact of these display technologies on different products? Which driver type is expected to provide high growth potential in the market? Who are the current potential competitors in the market, and what are their top priorities, strategies, and developments? The study involved 4 major activities to estimate the current size of the display driver market. Exhaustive secondary research was done to collect information on the market, including peer market and parent market. The next step was to validate these findings, assumptions, and sizing with industry experts across value chain through primary research. Both top-down and bottom-up approaches were employed to estimate the complete market size. Thereafter, market breakdown and data triangulation were used to estimate the market size of segments and sub segments. In the secondary research process, various secondary sources have been referred to for identifying and collecting information important for this study. Secondary sources include corporate filings (such as annual reports, investor presentations, and financial statements), trade shows, and professional associations (SID, CES/CTA, SEMI, IDEA, SOA, AIA, SPIE, FlexTech, CS International, and others), white papers, process and communication-related journals, websites, and certified publications. They also include articles from recognized authors gold-standard and silver-standard websites, directories, and databases. The secondary research has been mainly used to obtain key information about the industry’s supply chain, the total pool of key players, market classification, and segmentation according to industry trends to the bottom-most level and key developments from both market- and technology-oriented perspectives. The secondary data have been collected and analyzed to arrive at the overall market size, which has been further validated through primary research. In the primary research process, various primary sources from both supply and demand sides have been interviewed to obtain qualitative information for this report. The primary sources from the supply side include industry experts such as CEOs, vice presidents, marketing directors, technology and innovation directors, and related key executives from major companies and organizations operating in the display driver market. After the complete market engineering (which includes calculations for market statistics, market breakdown, market size estimations, market forecasting, and data triangulation), extensive primary research has been conducted to gather information and verify and validate the critical numbers arrived at in this process. 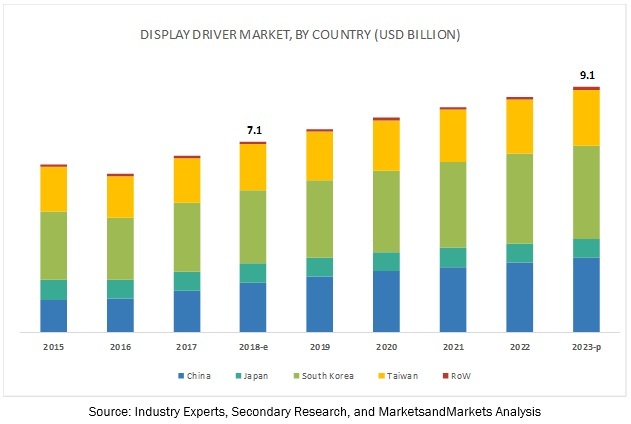 Primary research has been conducted to identify segmentation types, industry trends, key players, and key market dynamics such as drivers, restraints, opportunities, and challenges, along with the key strategies adopted by the players operating in the display driver market. Extensive primary research has been conducted after acquiring knowledge about the display driver market through secondary research. Primary interviews have been conducted with market experts from both the demand and supply sides across three major regions North America, Europe, and Asia Pacific (APAC). Approximately 60% and 40% of the primary interviews have been conducted with both the demand and supply sides, respectively. These primary data have been collected through questionnaires, emails, and telephonic interviews. In the complete market engineering process, both top-down and bottom-up approaches have been used, along with several data triangulation methods to perform market size estimation and forecasting for the overall market segments and sub segments listed in this report. Extensive qualitative and quantitative analyses have been performed on the complete market engineering process to list the key information/insights throughout the report. The key players in the display driver market have been identified through secondary research, and their market shares and product revenue have been determined through primary and secondary research. This entire procedure includes the study of annual and financial reports of the top players, as well as extensive interviews with industry experts (such as CEOs, VPs, directors, and marketing executives) for key insights (both quantitative and qualitative) on the display driver market. All percentage shares, splits, and breakdowns have been determined using secondary sources and verified through primary sources. All possible parameters that affect the market covered in this research study have been accounted for, viewed in extensive detail, verified through primary research, and analyzed to derive the final quantitative and qualitative data. These data have been consolidated and supplemented with detailed inputs and analysis from MarketsandMarkets and presented in this report. After arriving at the overall market size from the estimation process explained earlier, the overall display driver market has been split into several segments and subsegments. To complete the overall market engineering process and arrive at the exact statistics for all segments and subsegments, the data triangulation and market breakdown procedures have been employed, wherever applicable. The data have been triangulated by studying various factors and trends from both the demand and supply sides. To analyze competitive developments such as mergers, acquisitions, partnerships, agreements, collaborations, and product launches, along with research and development (R&D) in the display driver market. Samsung Electronics (South Korea), Novatek Microelectronics (Taiwan), Synaptics (US), Himax Technologies (Taiwan), Silicon Works (South Korea), Sitronix Technology (Taiwan), Raydium Semiconductor (Taiwan), Magnachip Semiconductor (Luxembourg & South Korea), FocalTech (Taiwan), MediaTek (Taiwan), and ROHM Semiconductor (Japan). With the given market data, MarketsandMarkets offers customizations according to companies’ specific needs. The following customization options are available for the report.